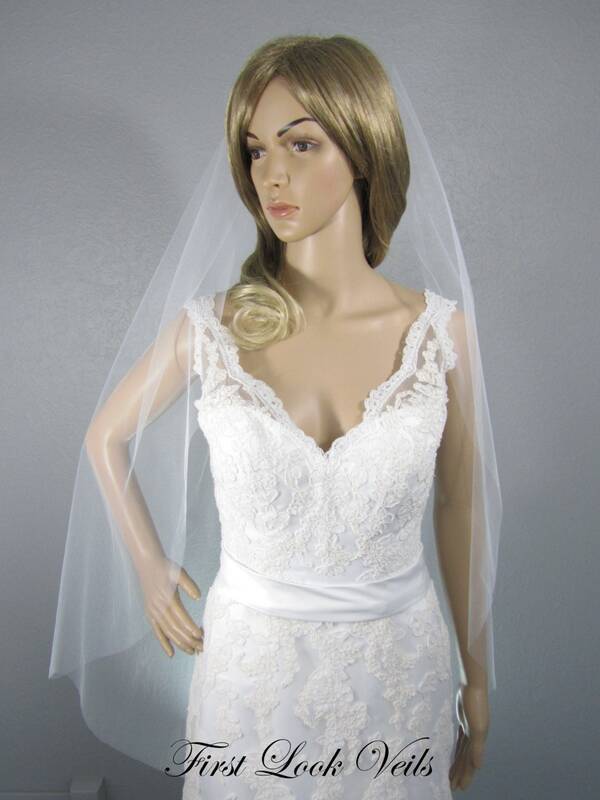 THE STYLE: This elegant one layer traditional fingertip bridal veil has a raw edge and can be made in any length (see dropdown options). 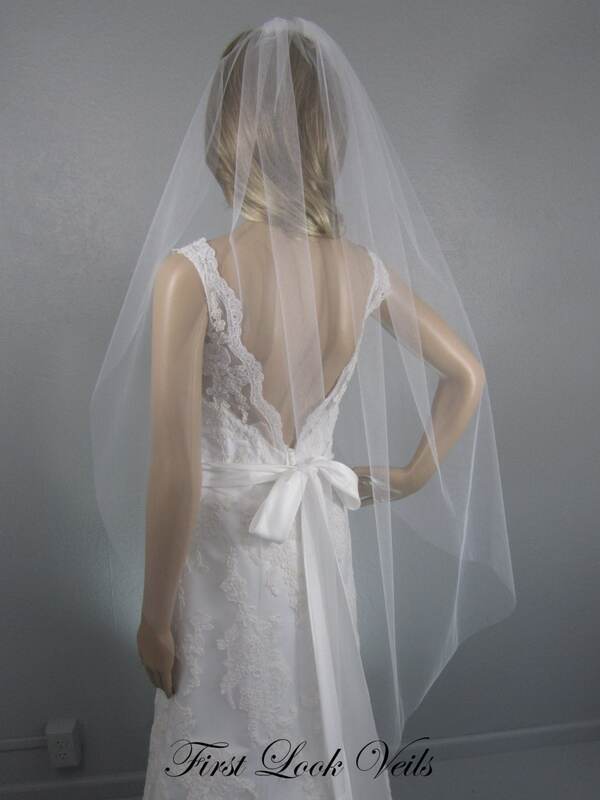 The Ballet, Chapel, Cathedral and Regal length veils are designed from 90 inch wide Bridal Illusion tulle. All others are 72" wide. 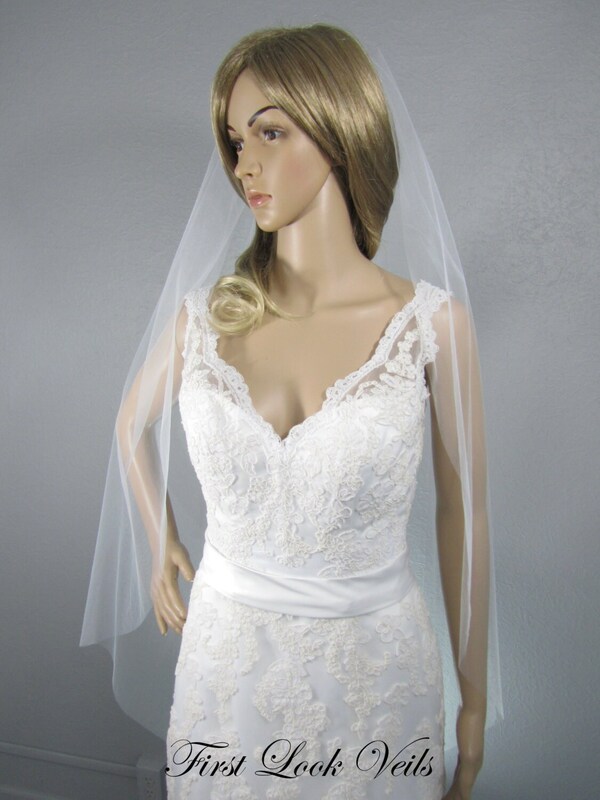 LENGTH: The pictured veil is a fingertip length. ILLUSION TULLE: We always use good quality soft bridal illusion tulle to design our veils. Bridal illusion tulle is a lightweight tulle with fine, diamond-shaped holes. It is a light material and drapes well while still holding its shape. It is widely used in bridal veils and is nylon which holds up well in damp weather. ATTACHMENT: The 3 1/2 " metal comb is wrapped with matching tulle. The veil is then hand sewn to the tulle (no glue is used). IN YOUR ORDER: A care instruction card is included in your order detailing how to remove wrinkles, etc. Each order also includes a small gift to show our appreciation for your order. 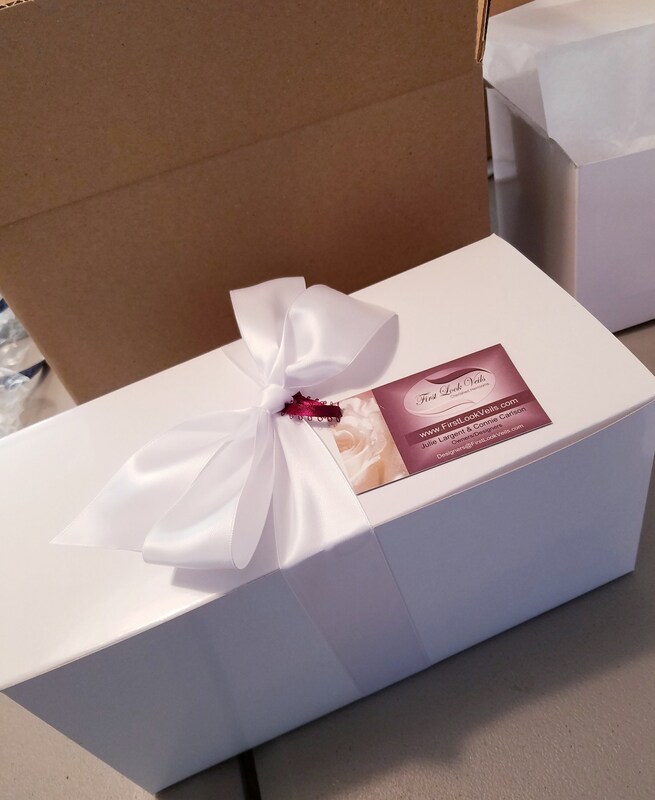 SHIPPING AND DELIVERY: We strive to complete your veil and mail it within 5 days of receipt of your order. Delivery usually takes 2-5 days in the continental US and up to 30 days internationally. Our standard color swatch card comes with white, diamond white and ivory samples. If you would like other colors, please put the three colors you would like to see in the comment section of your order. All of our veils are handmade to order in our smoke free studio. Please check our shop policies and shipping information. Convo us if you have any questions that aren't answered here. We would love to help you choose your perfect veil. Thank you for visiting our Etsy store! We strive to ship all items within 2-5 business days of receiving payment. If it will take longer than that, you will be notified. If the item is returned due to an incorrect address provided by buyer, we will need to charge a shipping fee in order to re-mail the package. Please note that we do not refund the item cost if the delay due to buyer's error should cause the product to arrive late for your event. Please double check your shipping address. Standard shipping does not include insurance. Should you want your package insured, there will be an additional cost. Packages are normally received by you within 3-7 days of shipping in the USA. For international orders, please allow 30 days from the day of shipping. Please note that we can only provide ESTIMATED delivery dates, as provided by USPS, and cannot guarantee delivery on USPS estimated date. We assume no liability for delivered shipments, weather delays, custom delays and any other delivery issues once the package has left our studio and has been accepted by the mailing authority. CUSTOMS FEES, TARIFFS, and any other government fees are the buyer's responsibility to pay. Please check with your countries policies in regards to taxes/duties. UK residents will incur a delivery tariff/tax before delivery. Please be aware of this before purchasing. Returns and exchanges are not accepted due to the fact that we create each item to order. Please choose your product carefully. Read the description provided. Order a sample card if you are concerned about the color matching your dress. If the item is damaged in transit, please convo us. Convo us if you have questions. We are always happy to answer them. Sorry but there is no option for trying it out prior to purchase. To our EU brides, should you want to return your item please contact us within 14 days of receipt via Etsy Convo or by emailing us at designers@firstlookveils.com and return the item to us within 30 days in order to qualify for a refund. First Look Veils is based in the United States and has been selling veils and bridal accessories on Etsy since 2014. We sell mainly to buyers in the United States, but offer our items for sale world-wide. •	To fulfil your order, you must provide us with certain information (which you authorized Etsy to provide to us), such as your name, email address, postal address, payment information, and the details of the product that you’re ordering. You may also choose to provide us with additional personal information (for a custom order, for example), if you contact us directly. •	when you have provided your affirmative consent, which you may revoke at any time.